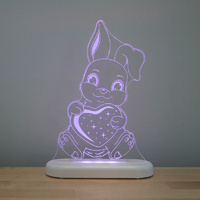 Aloka Sleepy Lights Bunny | Comfort little ones who fear the dark! Comfort little ones who fear the dark! Safe for little fingers to touch and use! What a wonderful idea for Easter this year, it's a gorgeous alternative to the usual chocolate eggs! Aloka Lights are the answer to children's night lights that parents have been waiting for. This colourful night light has been designed by parents for parents, with a fun design and features that are fun for little fingers too! It's the gift that keeps on giving! Your Aloka Sleepy Lights Bunny features a remote control and a set of beautiful LED colours. You can control the brightness of your light by using the dimming function to navigate the 4 levels of brightness. You'll find your Aloka Sleepy Lights Bunny also provides just enough light to comfort little ones who fear the dark, or for mums during feeding times to settle their baby quickly. If your child wakes during the night, the soft glow of your night light will help settle them back to sleep. - A remote control to change colours and change the brightness (the brightest is enough to read by). - A beautiful set of designer LED colours including a warm and cool white (13 colours in all). - A dimmer function which controls the 4 levels of brightness. - A sleep button that auto lowers the brightness to low levels perfect for sleeping. - A timer which turns the night light off after a period of time. - A rainbow button that gently cycles through all the colours. - A side lamp button that activates pure white at it's brightest level. - A 12 v power supply and safe, low voltage, low heat LED's that are long lasting and energy efficient (can also be powered from any USB source, including multi-port powered USB hubs). Made from a resilient acrylic smart flat pack design. Dimensions: 10cm tall x 14cm wide x 0.3cm deep.